Dedicated to all who speak less than they know, the Bon Vivant League Rules governs all Strat-o-matic games played in the American, Central, and National divisions of the Bon Vivant League. This is a compilation of rules inspired by the madness of past and current BVL owners since 1903, the different levels of Strat-o-matic rules, and the Free State Baseball League and their “influential” book of rules. 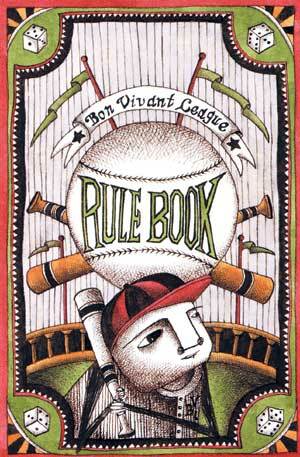 The talented Mairov Salomon, a slugger in her own right, illustrated the front and back covers of the Bon Vivant League Rule book (right). 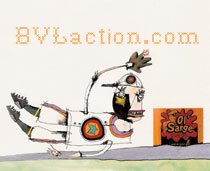 Our logo was designed by the legendary David "Ol' Sarge" Miller. Andy Villalba Jr., Andy Villalba Sr., and Andy Wong. Tom Chillemi, Jay Cruz, Greg Duva, Andrew Goldberg, Tom Lavin, Alan Levine, Denise "Maz" Masalsky, Jay Nemquist, Greg Rapport, Frank Ruscitti, Tony Ruscitti, and Al Lee Wyer. 1936; Seward Park, 1937– 1939; Banksville, 1940; Homestead, 1941; Seward Park 1942; via internet, 1943; Seward Park 1944-45; New York, 1946. The nine (9) BVL owners discussed and passed the following 3 proposals at the Owners Meeting via the internet. Six (6) votes were needed for passage. 1. Clubs will start the regular season with a 5-man rotation. 2. * Starters can start on 3 days rest (1) if in their previous start they pitched 3 or fewer innings or (2) in Games of Elimination. (a) Starters and Starter/Relievers who pitched 7 innings or less can enter a game fatigued (with no day of rest) in the 8th inning or after and pitch for a maximum of 1 inning, or with 1 or 2 days of rest, for a maximum of 2 innings. (b) Relievers and Reliever/Starters can enter a game fatigued in the 7th inning or after and pitch for a maximum of 1 inning. (c) All pitchers are allowed to pitch fatigued only once in a series and once during the regular season. (d) Starting lineups must include players eligible at each position. Exception: injuries. 1. Strat-o-Matic Rule 25.11 in effect. Void/update inconsistent language, including: Advanced Injury Chart; 6.03 through Note 6.01.2; Note 6.01.6; Season Ending (Tony C.) Chart (change 19, 15 days to 30, 60 days, respectively). 2. Note: 600 criteria to include at-bats and walks; for Starter/Relievers, follow SP criteria; for Reliever/Starters, RP criteria. The nine (9) BVL owners discussed and passed the following 2 proposals at the Owners Meeting via the internet. Six (6) votes were needed for passage. A best-of-seven series; winner advances to the World Series. A 10-round draft to begin in 1944. The nine (9) BVL owners discussed and passed the following 2 proposals at the Owners Meeting on April 5. Six (6) votes were needed for passage. Shorten the 2nd, 3rd, and 4th periods from 10 weeks to 8 weeks, respectively; the first period remains unchanged (at 10 weeks). 1. All pitchers may be injured on the mound when a "Triple 6" is rolled during a player's at-bat. For the defined pitching groups, above, the worse that can result for a pitcher injury is the removal from a game only (unless Season Ending or Career Ending injuries occur). Relievers with 45+ saves entering a non-save situation, i.e., winning team is not ahead by 3 or less runs in the 9th inning or later. For a reliever with 45+ saves who enters into a save situation that later becomes a non-save situation, the worse that can result from an injury is his removal from a game only (unless Season Ending or Career Ending injuries occur). The nine (9) BVL owners discussed and passed the following proposal at the Owners Meeting on March 30. Six (6) votes were needed for passage. If a LINEOUT is rolled on a pitcher's card, override the result. Use Lomax Chart for other "lomax" rolls. 1. If a "PO" rare play occurs with 0 or 1 out, and runners are on first and second base, or the bases are loaded, consider this an Infield Fly Rule (batter is out, runners hold. The nine (9) BVL owners discussed and passed the following proposal at the Owners Meeting on March 17. Six (6) votes were needed for passage. 1. Void catcher option of throwing out any runner. 2. In double or triple steals, only the lead runner's ratings will be used. The defense may attempt o throw out the lead runner only. The trail runner(s) automatically advances one base. The nine (9) BVL owners discussed and passed the following two (2) proposals at the Owners Meeting on March 19. Six (6) votes were needed for passage. 1. Highest pick a club can forfeit as free agent compensation is a third round pick, etc. A club maintains a minimum average of 6 games per month through the first 3 Game Deadlines (include the opening month if the season begins during any of the first seven days of that month. Use the 6-game monthly minimum to determine G15, G30, G45 deadlines that fall before the 15th day of the month). Each Game deadline constitutes a 10-week period. Rosters must be recieved 3 weeks from the start of the First Deadline period; computer (HAL) sheets, 8 weeks. Immediately upon the conclusion of the current regular season any team that has been assessed a fine or fines during the current season shall have its salary cap reduced by the amount of said fine(s) until the conclusion of the current Free Agent draft. 7. Three days after the G60 deadline, Mr. Luplow will begin completing all remaining games. He is not required to consult club owner(s); he will make all necessary judgments, etc., in the best interest of the BVL. Such action is final. A season extension is granted. 1. Valid protests may ONLY be heard -- and ruled upon -- between the G60 deadline and three weeks before the officially scheduled owners meeting. Notify the commissioner (or division presidents). They will review and determine their validity. Valid protests may be overturned completely, partially, or not at all; rulings are final. (b) such contact information was made immediately public (recorded by Al Luplow, i.e., Waiting For Action list). 3. Consider other protests invalid, including blaming Al Luplow (or other parties) for not playing games in a timely manner. Division presidents require consensus to overturn penalties, if at all. If not, original rulings stand. Brick Church must post their rosters, HAL information online to avoid penalties. Void previous language and past practices pertaining to GIVE US d**n ACTION. The nine (9) BVL owners discussed and passed the following three (3) proposals at the Owners Meeting on March 14. Six (6) votes were needed for passage. Baserunner's Running rating, plus right fielder's arm (+/-), and +2 for the throw to third base from right field. 3. The runner is out on a d20 result of 20 only. 4. If the roll is higher than the highest safe chance, but lower than 20, the runner holds at second base. Safe: 1-15 (14 - 1 +2); Hold: 16-19; Out: 20. This rule applies only to FLY (RF)B readings found on pitcher and player cards. 1. The baserunner may make only one attempt for a good lead while he occupies the same base. Exception: the fielding manager later decides to cease holding the runner on base. Exception: the fielding manager changes to a pitcher with a worse hold rating or a catcher with a worse arm. The nine (9) BVL owners discussed and passed the following four (4) proposals at the Owners Meeting on March 15. Six (6) votes were needed for passage. 1. Reduce top club rosters from 26 to 25 players. This proposal will eliminate a Strat discrepancy; dramatically increase the value to players who are rarely injured. * Roll d20 again for possible season-ending injury. Refer to Season Ending Chart. REM -- Player out for remainder of game. For batters with 600 or more at-bats (at-bats and walks only), the most they may be injured is 3 games (unless Season Ending or Career Ending injuries occur). 1. Void current Pitcher Injury language, i.e., doubling injury totals for pitchers with less than 200 IP, etc. 2. All pitchers may be injured on the mound when a "Triple 6" is rolled during a player's at-bat. Relievers with 40+ saves entering a non-save situation, i.e., winning team is not ahead by 3 or less runs in the 9th inning or later. For a reliever with 40+ saves who enters into a save situation that later becomes a non-save situation, the worse that can result from an injury is his removal from a game only (unless Season Ending or Career Ending injuries occur). 3. Follow the injury procedure for batters. First complete the play, then determine the possible injury. In the event a rested starter or rested starter/reliever is unavailable (including Triple A roster) to pitch an injured starter's next start, a rested reliever/starter may be used. during the World Series. In such a case, a club will use the least tired starter available. He's automatically fatigued. In the event 2 or more relievers are placed simultaneously on the disabled list, and no Triple A relievers are available, a club may use a Triple A starter in relief only. His fatigue rating is 3 IP. Every three years, the BVL may redefine the pitching group, stated above, if the correlation between the group (and its statistics) and 162-game players rises above a 1.9 per cent difference during the most recent 5-year period. For example, if the proposal is passed for the 1937 season, the next revisions may occur after the 1940 season is completed. The eight (8) BVL owners discussed and passed the following proposal on January 19. It received four (4) votes for passage. 1- BVL contracts; all Yats players will be sent to war (Spanish Civil War, 1936-39); all Yats, alphabetically, will be given two 3-digit numbers for daily NY Lotto Numbers (aka Pick 3) drawings (000-049 for mid-day drawing; 500-549 for evening). Lotto reads begin a day after this proposal is passed with enough simple votes; concludes the day before the dispersal draft begins. [a] If mid-day number occurs, Yat player has died. [b] If evening number occurs, Yat player is injured in battle; veteran is out the 3-digit sum worth of games, i.e., Matt Stairs (evening number is 148 = 13 games out); club charged with a transaction move if wounded hero is brought up, but is not charged with spending a season in the minors. Note: In the rare case an injured Yat is later killed in action, BC will name its stadium after him. 2- Andy Villalba Jr. is new Tampico owner, gets right to vote, trade immediately. 3- Three (3) team divisions are created; Central division added; division presidents voted by June (except if Emrich, Simonds end up in current divisions; until then both will resume their duties); no change to presidential language; new divisions created by draw of hat one week after this proposal is voted in; hat belongs to either president simonds or president emrich. g. American; h. Central; i. National. Note: post-season roster, trade deadline, and we need d**n action clauses to be formulated, to reflect schedule options. 5- 3 Division Winners; clubs seeded 1-3; all seeds/home field determined by best record,i.e., winning percentage (all such ties between 3 seeded clubs broken by current rules); best of 5 (2-2-1 format); winner advances to World Series; length of Yogi series, plus rainouts, will count toward players injured for No. 1 seeded club; rosters may be revised before WS starts. 6- 2 rounds, via email; first round (slotted worst-to-first), second round (first-to-worst); 3 weeks before owners meeting; Yat player salaries, contracts honored by new club; unchosen players are free agents, all contracts, including long-term deals, are void. 7- All Yat trades remain in effect. In 1936, clubs with select Yat picks in the usual manner. In 1937, Yat picks will be chosen at the end of the round in which they held a Yat pick. 8- First round begins three days after regular season concludes; World Series starts 2 days after Game 5 is played; World Series pushed back entirely 1 or more days if Game 5 is rained out 1 or more days. 10- Post-season results to reflect draft order, i.e., first-round loser selects 7th in each round; World Series loser selects 8th, etc. The ten (10) BVL owners discussed and passed the following one (1) proposals at the Owners Meeting on March 2. Seven (7) votes were needed for passage. Fielders can hold a runner on first, second, or third base, and look for a bunt at the same time. [Delete the following senence: runners must roll for the good lead, but do no subtract 2 or 4 (for holding a runner) from their stealing rating. Note: The defense may not play the Infield In and hold a runner on base at the same time. 1. Order of selecting ballparks (or making modifications, i.e., changing ballparks) is based on the reverse order of the Free Agent Draft. 2. Modifications, announced during the owners meeting only, will take affect the following season. 3. Owners are allowed one modification every 7 seasons. Exception: New BVL ownership and/or modifications are made to MLB park. In both scenarios, follow clause 2. Note: Grandfather Brooklyn Bruiser’s ballpark usage during home games played live. Note: Effects for all parks chosen in 1933 are locked in. homers—L: 1, flyball (rf) B 2-20/ R: 1, flyball (lf) B 2-20.
homers—L: 1-6, flyball (rf) B 7-20/ R: 1-3, flyball (lf) B 4-20.
homers—L: 1-12, flyball (rf) B 13-20/ R: 1-12, flyball (lf) B 13-20.
homers—L: 1-5, flyball (rf) B 6-20/ R: 1-5, flyball (lf) B 6-20.
homers—L: 1-4, flyball (rf) B 5-20/R: 1-4, flyball (lf) B 5-20.
homers—L: 1-3, flyball (rf) B 4-20/ R: 1-9, flyball (lf) B 10-20.
homers—L: 1-11, flyball (rf) B 12-20/ R: 1-8, flyball (lf) B 9-20.
homers—L: 1-13, flyball (rf) B 14-20/ R: 1-7, flyball (lf) B 8-20.
a. Ignore all readings that have a (black diamond) symbol to the left of them. b. Refer to the Ball Park Effect Chart. c. Find the home stadium and the correct batting stance of the current batter (L=lefty or R=righty). This is the new dice range for the homerun. d. Roll the 20-sided die to determine whether the batter has hit a homerun or a Flyball()B. Note: Players with weak power (W) may not hit home runs; change all Homerun results to SINGLE** (runners advance two bases). a. Ignore all readings that have a (upside down black triangle) symbol to the left of them. c. Find the home stadium and the correct batting stance of the current batter (L=lefty or R=righty). This is the new dice range for the single. d. Roll the 20-sided die to determine whether the batter has hit a SINGLE* or a lineout. Note: Clear triangles are in effect. When this simple appears, ignore the first reading. Instead, use the second reading (in italics) beneath it.